OLD PARKED CARS. : 1967 Volkswagen 1300.
this is a beaut. these things are always either over-restored or beat to hell, but you occasionally see one that's set up just so, and you think, "well heck, i'd drive that." 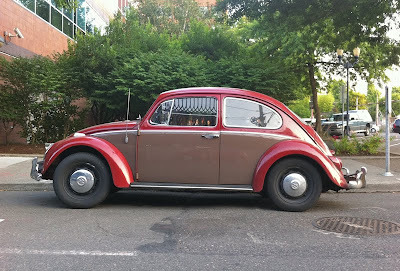 i just wrote up a history of the beetle for work, and my appreciation for them has gone through the roof. this one is a '66, the year the engine reached 50 hp. This one appears to be a '66, given the glass-covered headlights and the "1300" script on the rear lid. 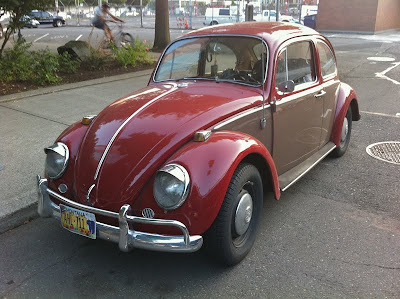 1966 was the first year for the vented wheels, but the last year VWs had the glass over the headlights. It was also the only year for the "1300" script. Of course, it's possible the parts have been swapped from an older car, as most parts are interchangeable year-to-year. Or it's possible the car was built in 1966, but not sold until '67. Some states used to list a car's model year as to when it was originally titled, not when the car was built. Not a '67. The headlights and fenders could have been swapped but the rear apron and deck lid are also older. '67 deck lid would have a slight hump in it and it was a one year only part as were many on the '67. Also the rear bumper is not '67. 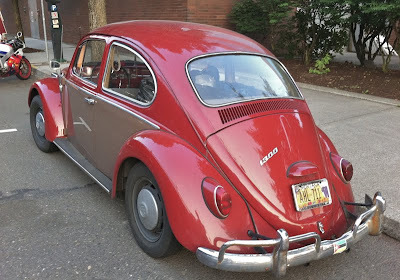 I can say, with confidence, that its a '65 or '66 beetle.